" This ripe wine is full of yellow fruits that are balanced by crisp acidity. A creamy texture gives a smooth character that contrasts with freshness at the end. Drink from late 2019. " 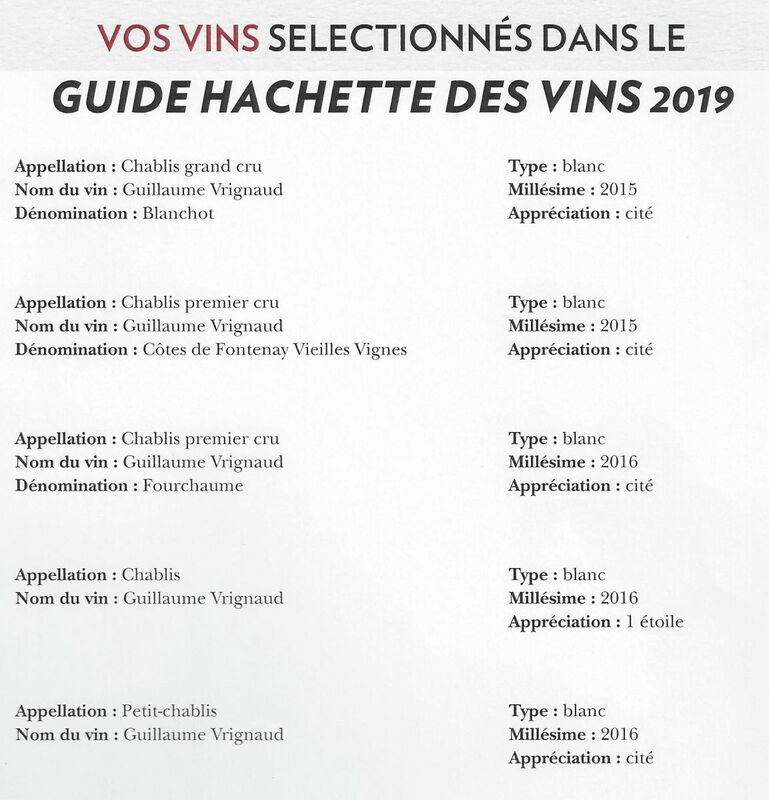 "Produced from old vines dating to 1955 in a parcel of the Fourchaume vineyard, this wine is full of ripe fruits filled out with spice and almonds, lifted by fresh acidity. It is a rounded wine, full bodied and now mature. Drink now. " 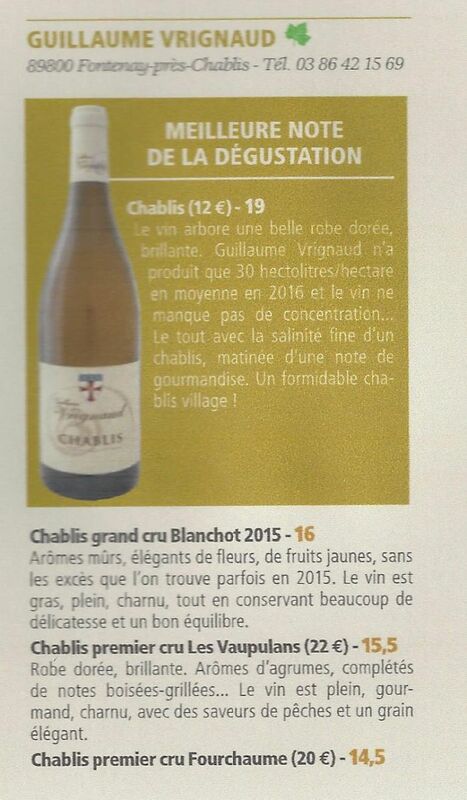 Notre Chablis 2015 est cité, le Petit Chablis 2015 décroche 1 étoile ! Arômes épicés, fruités, floraux, avec une note grillée. 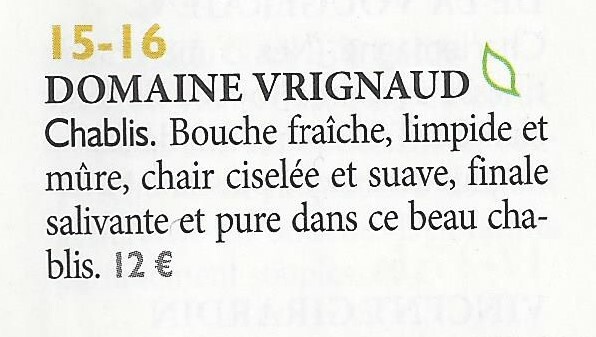 Le vin est délicieux : enrobé, croquant, gourmand et tonique . 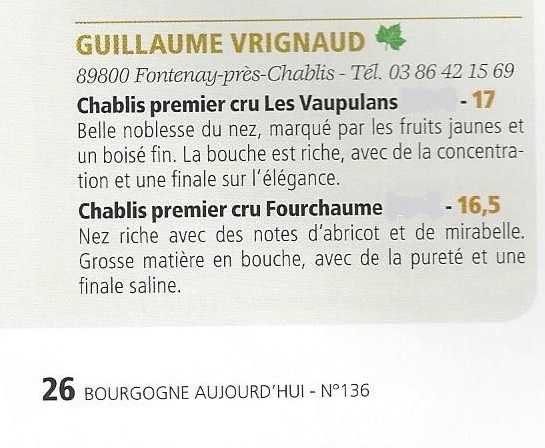 Chablis premier cru Fourchaume Les Vaupulans 2015 note 15"
This wine reflects the ripeness of the vintage while still retaining crisp minerality. Creamed apples are balanced with a tangy texture and soft acidity. The wine finishes with a crisp aftertaste that gives a great lift. Drink the wine now. 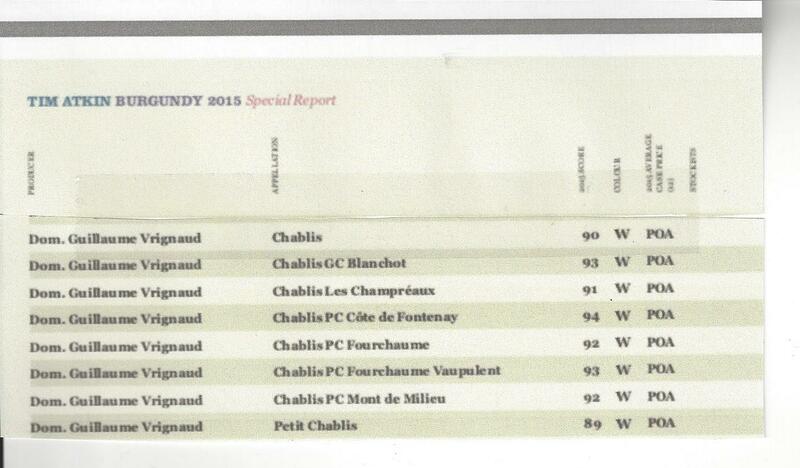 From a single parcel on the Vrignaud domaine, the wine has 30% wood aging. That gives a ripe full character which emphasizes the rich vintage. Toast mingles with rich apples and touches of citrus. 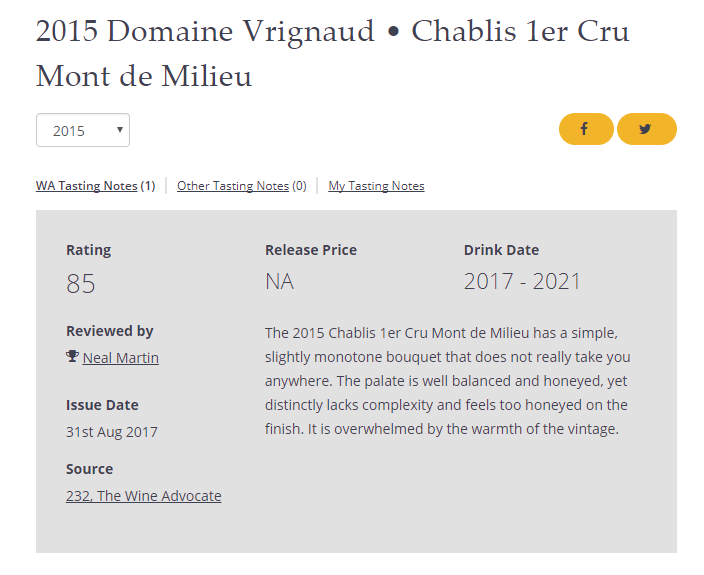 Drink this refreshing wine from 2017. From old vines planted in 1955, this dense, impressive wine offers both perfume apple and pear fruits and a creamy texture. Behind this generous front, the wine is tight, steely and needs to age. Give it until 2018. This is fresh with lemons and apples filled out by a mineral texture that gives the wine a fine bite. It's light, crisp and zesty. Drink now. This is a soft, rounded wine full of yellow fruits, pears and red apples. It is textured with minerality and tangy lemon zest. The acidity at the end is still fresh and the wine could do with some more time before drinking. Wait until late 2016. The fruit here is pure, fresh with the merest hints of its future richness. The green fruits, citrus and acidity are prominent, with a hint of toast and a finishing line of minerality. It needs to age, so drink from 2017. This is a beautiful, bright wine, still very young although already hinting at the warmth of Fourchaume. The steely texture is right up front, along with crisp apple and citrus fruits. Underneath, a vanilla, toasty character shows promise for aging. Drink from 2017. "Strong struck match character at first but then apple and pear fruit with aeration. 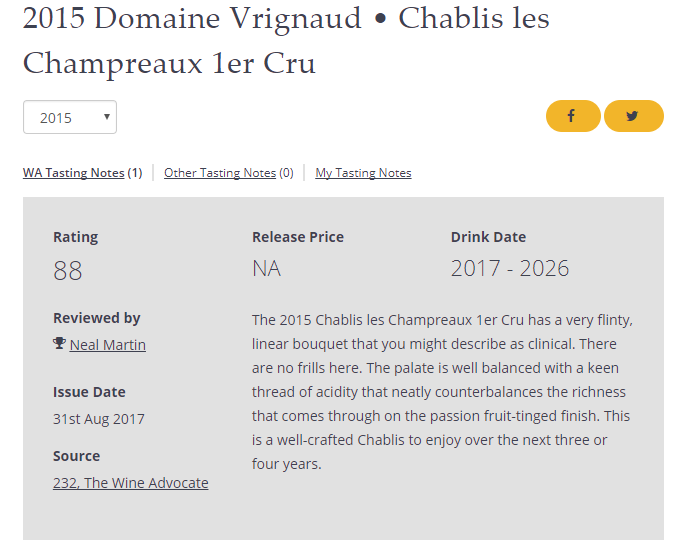 Lively on the palate with a smocky finish"
This three-acre vineyard is home to Vrignaud's oldest vines, planted in 1955 on a southeast-facing slope, farmed organically. The wine aged on the lees in stainless steel casks for more than a year, developing a broad texture and a slightly stinky mineral intensity. The consentration of flavor from low-yielding old-vine fruit gives this an edge in a challenging vintage, its pale fire glowing through Mandarin orange pith flavors, its grand acidity a naked mineral streak ripped from the oyster-shell dunes of Chablis. Youthfully aggressive, this is a wine of brilliant richness and staying power. 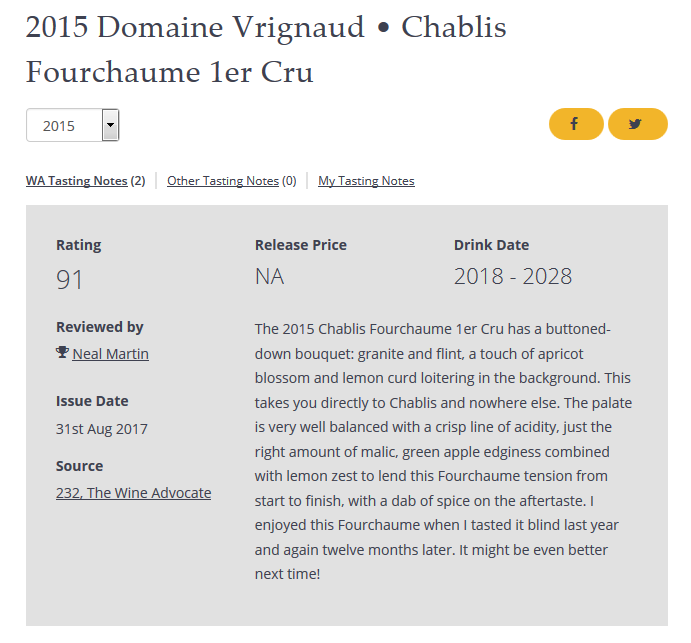 Remarkably well balanced with a vibrant acidity and notes of crisp fruit, this wine is a flawless complement to an array of cuisines, offering a classic Chablis profile that is perfectly poised between freshness and richness. Chalky clay and limestone soils impart a solid mineral base that structures the wine, maintaining the roundness of the grapes which have gone from vineyard to presswith little to no intervention. 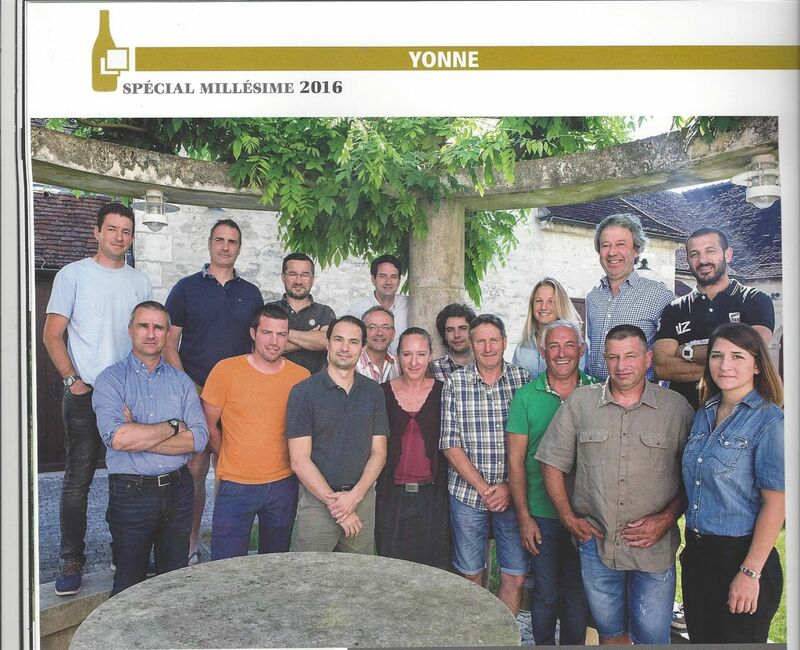 Wine & Spirits - "Guillaume Vrignaud makes this wine from five parcels of his family’s domaine, which earned organic certification in 2013. The 25.6 acres of vines that contribute to this blend average 27 years old, their fruit fermented in stainless steel, producing a wine of blinding white limestone that seems to extend to the horizon in all directions. Underneath, there’s fierce mineral acidity, compressed flavors of yellow herbs, scents of linden and acacia. It’s tense, a powerful force of herbal chardonnay greenness that stores all the wine’s future complexity. Decant it this summer for a clambake, and be sure to cellar some for enjoyment in the years to come." 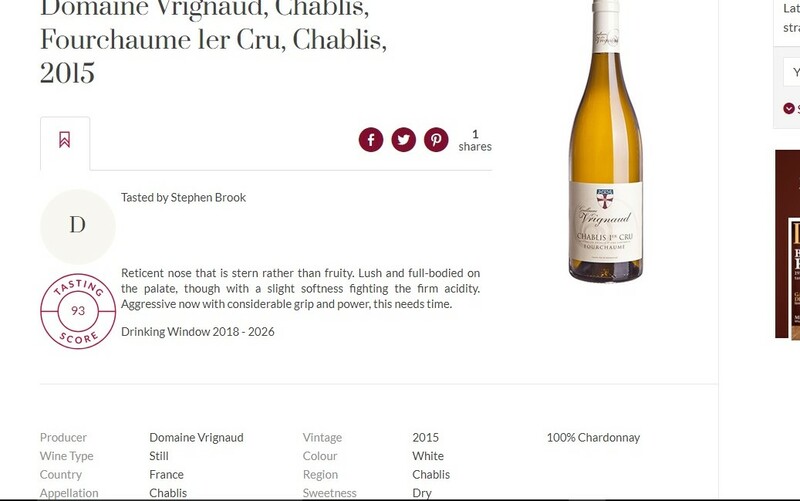 Wine Spectator - "A stony, minerally undertow marks this steely Chablis, with lemon, apple and earth flavors chiming in to lend overall harmony. The long finish shows notes of oyster and fresh-squeezed lemon. Drink now through 2020." Wine Spectator - "Vibrant and juicy, this white evokes green apple, lemon, wild thyme and citrus peel hints. The chalky ending is clean as a whistle. 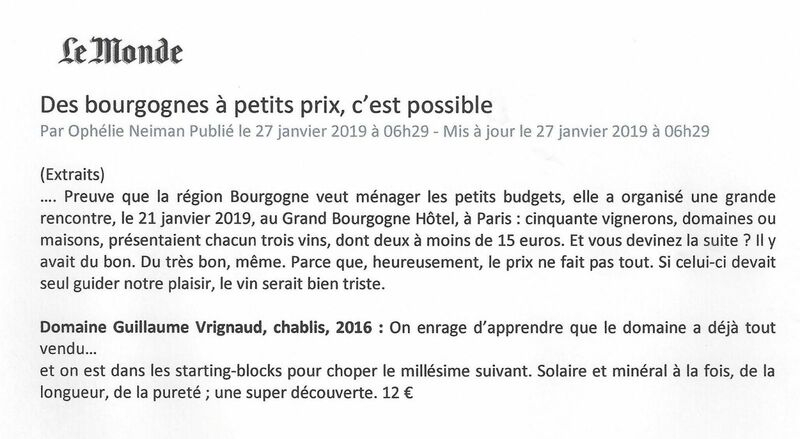 Drink now through 2019"
Pour voir la liste des anciennes récompenses, cliquez ici.